Thursday, April 23, 2009. I put on my navy blue cap and gown and looked in the mirror. It was all very surreal. Here I was, heading off to that grand ceremony of pomp and circumstance -- not as a spectator, but as a participant. 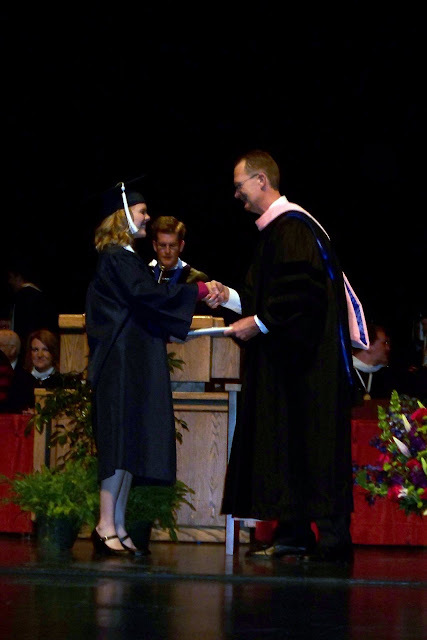 I couldn't really get over the fact it was ME in the cap and gown. I had to be dreaming. But I wasn't (I pinched myself). The Marriott Center was packed to the brim. Half of the occupants were dressed just like me, tassels of various colors dangling beside their faces. I was surrounded by conversations of past professors, internships, future plans and jobs. Many chatted nervously on their cell phones while waving vigorously, saying, "Do you see me now?" I just soaked it all in. I held myself together until all the graduates stood and the degrees were conferred. As President Samuelson said, I really had done everything required of me -- and more -- to earn this degree. That word, earn, took on a new meaning. My eyes welled up with tears. President Uchtdorf and Elder Nelson gave excellent addresses. I was surprised to learn that Elder Uchtdorf's daughter had graduated from BYU 19 years ago -- with infant twin boys in tow. I didn't have it so bad, I thought. The next day was convocation. 8:00 a.m. at the deJong Concert Hall. I reminisced with classmates while we lined up in the tunnel. I felt myself brimming with confidence. The person I was before my internship and the person I am now are two completely different beings. I am not afraid of conversation. I don't get nervous around strangers. I stand up straight and don't fold my arms when I talk to people. The student speakers did a fabulous job. They even used video to accompany their speeches. They were interesting and held the audience's attention. I guess you'd expect nothing less from a communications major. When the time came to receive my diploma, I got that butterflies-in-stomach feeling and realized this would probably be it for me. No more papers, exams, presentations, lectures, or textbooks. I was a little wistful. But I could come back if I wanted to. You never have to stop learning. I strutted across that stage and proudly shook Dean Jones' hand. Walked off and got a picture in front of an American flag. A lady flipped my tassel for me. Took my seat. "At the end of your life, you will never regret not having passed one more test, winning one more verdict, or not closing one more deal. You will regret time not spent with a husband, a child, a friend, or a parent .... Whatever the era, whatever the times, one thing will never change: fathers and mothers, if you have children, they must come first. You must read to your children, and you must hug your children, and you must love your children. Your success as a family, our success as a society, depends not on what happens in the White House, but on what happens inside your house." And that's when I firmly decided I will not be holding a nine-to-five job any time soon. There will be opportunities for me, no doubt. Part-time jobs, projects, work-at-home ventures. And see, that's what's so great about having a college degree. I will be able to have more opportunities than I would without it. I won't always have to accept them, but they will always come my way. I know it. Right now, my family needs me at home. After convocation, I chatted with a few of my professors about my internship and took pictures with classmates, family and friends. It was a happy time for everyone. The sun was shining, despite a 70% chance of showers forecasted the previous day. How could the sun NOT shine on a day like this? I looked around and thought to myself, Self, we did it. And now we have the whole world ahead of us. I HAVE A BA IN COMMUNICATIONS WITH AN EMPHASIS IN BROADCAST JOURNALISM AND A MINOR IN MUSIC! Congratulations Jenna...I'm so impressed... You've worked so very hard, and YAY for you!!! Jenna, I'll say it again. I'm so proud of you!! You've worked so hard and have accomplished so much. You deserve it! Congrats! You go, girl! I'm so glad I stumbled across your blog today -- that quote brought tears to my eyes. So true that there will be time in life to work as a professional in a career (later, or as part-time, etc). Time with family and children goes by so quickly, and if we don't catch it while we can, it'll be gone before we know it (or so people tell me!!). I, too, am a BYU graduate (1994). I went on & got my Masters degree and used it working 1 yr until I had my first daughter. then I worked part-time for 5 yrs until baby #4 came, then I quit. While it was a huge adjustment, I don't regret it a single minute. PS: Nice to meet you -- found you on Mormon Mommy blogs! Jenna, way to go girl! You should be feeling so awesome about yourself. Good work!!! Beautifully written and completely from the heart. What a great quote from B. Bush's speech. I'd never heard that, it's perfect. Way to go! Congratulations Jenna!! You and your hot self graduated! Learning sure does change people. I can see that you have grown and changed for the better! Yay for graduation! WAHOO! I am SO happy and proud of you Jenna. No one knows how hard it is to get a degree unless they have gone through it themselves, and we all have our own unique challenges and trials throughout our college education. I love that quote. It reminds me of what I read on someone else's blog, why would you want someone else to raise your children when you can do it yourself? You are a great mommy and I know you will have plenty of opportunities to excel in both worlds. You rock Jenna! Congratulations! I'm so jealous! That's amazing Jenna! Never delete this blog so that when the the times get tough in my ongoing college days, I can look back and know that it does happen! YAY FOR JENNA! You are still my inspiration after 12 years of friendship!